In 897 Pope Stephen VI put the corpse of one of his predecessors, Formosus, on trial. 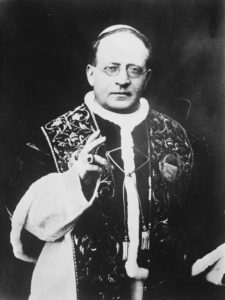 The current pope ordered that the former pope’s dead body be dressed in papal finery and put on a throne to stand trial. Stephen VI acted as prosecutor, accusing his predecessor of attempting to have two bishoprics at once and coveting the papacy. The current pope then ordered the Formosus’ body stripped of its finery, the fingers on his right hand be cut off, and his body thrown into the Tiber. 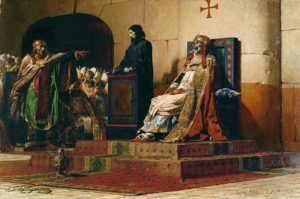 The painting below, Pope Formosus and Stephen VII, is the work of French artist Jean-Paul Laurens and painted in 1870. It wasn’t enough for fascist Italy to adopt the rhetoric and imagery of ancient Rome, it also hoped to have a present-day empire. To do that Mussolini launched an invasion of a country that had defeated Italy in 1896: Ethiopia. To win this time, Italy would not merely invade with ground troops, like it had the last time. Instead, it would rain down chemical death upon the African kingdom, and then declare it an imperial possession. Last week Asano, Lord of Ako was ordered to commit seppuku, and his newly unemployed samurai were plotting revenge on Kira, the noble whom they blamed for their lord’s death. This week, the 47 ronin extract their revenge on Kira, and the incident becomes one of the most retold narratives in Japanese history. 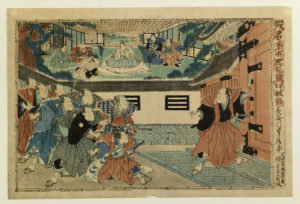 The image below illustrates a scene from Kanadehon Chushingura, the most famous fictionalized version of the 47 ronin story. The characters in Kanadehon Chushingura have different names than the actual historical figures whom they purport to represent, audiences in 1748 and onward would have recognized the fiction as being roughly analogous to actual events. Anymore, Chushingura refers to the entire body of media either directly about or touching on the 47 ronin incident. One of the most famous and bloody incidents in samurai history is the story of the 47 ronin, a group of masterless samurai who extracted bloody revenge on behalf of their dead lord. The actual events of the incident are hard to parse out, as the facts of the events have been occluded by popular culture, drama, reinterpretation, and retelling. 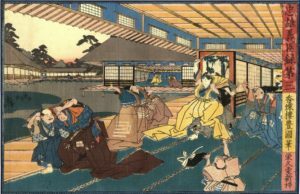 What we do know for sure is that in 1701 the daimyo of Ako (a domain near modern Osaka) was forced to kill himself after assaulting a courtier, Kira, in Edo. After the lord was dead, his various samurai were suddenly unemployed, and forty-seven of them planned revenge. The traditional telling of the story is that Kira was supposed to instruct Asano in the ways of etiquette at the Shogun’s court, and that Asano was supposed to bribe him in order to be treated well. Kira was dissatisfied with Asano’s bribe, insulted the young lord, and, in a fit of rage, Asano drew his short sword and wounded the etiquette instructor. After Asano’s death, his samurai took it upon themselves to finish what Asano had started, and vowed to kill Kira. The image below is a probably stylized rendering of Asano, the lord of Ako, drawing his weapon on Kira in a fit of rage. The most complete tyrannosaurus rex skeleton in the world, nicknamed “Sue,” in honor of the paleontologist who discovered her, stands over adoring crowds at Chicago’s Field Museum. However, Sue’s journey the field museum was not an easy one, though. Prior to finally being put on display in 2000, there was a battle for Sue’s bones. A fossil hunter, the ranch owner, the federal government, and a Native American tribe all vied for ownership of the dinosaur, in a fight that involved the FBI seizing a warehouse of dinosaur bones, and a man going to prison. Sue is the subject of Dinosaur 13, a documentary sympathetic to Peter Larson that has drawn some criticism. This week’s episode has a slightly different format from previous entries. 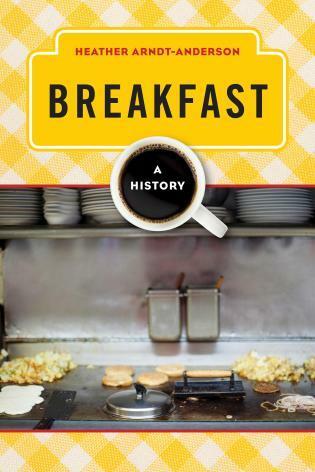 We sat down with food historian Heather Arndt Anderson, author of Breakfast: A History, and talked about this history of breakfast. Topics ranged from how orange juice became a breakfast drink, how bacon was marketed as an essential morning meat, the accidental invention of corn flakes, and the gender politics surrounding breakfast. And, because I mentioned it on a tangent, here’s a time lapse of the Ottoman Empire over time. Nov 13 201404 BONE WARS! Scientists are motivated by curiosity, by the desire to help their fellow humans, by compulsion and, sometimes, by irrational personal vendettas. 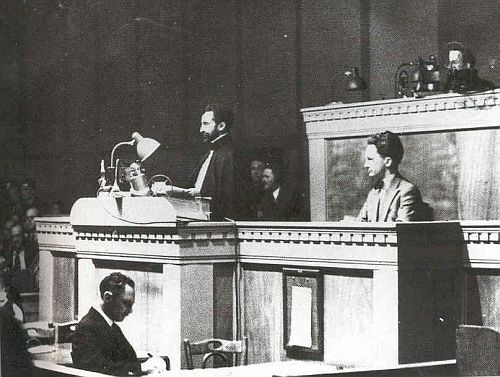 Edward Drinker Cope and Othneil Charles Marsh were two leading paleontologists during the late 1800s, and discovered approximately 130 species between them, and were instrumental in confirming the then-new theory of evolution by natural selection. They also hated each other, and each tried to cut the other down to size with methods and tactics that simply would not fly in the scientific world today. The 1897 painting below by Charles Knight is not at all a historically accurate depiction of dinosaurs, but it is amazing. It’s also apt. The art is called Leaping Laelaps, and uses Cope’s name for the dinosaur. The species was later renamed dryptosaurus, a name that Marsh gave it. Cope’s backward elasmosaurus, with the head on the end of the tail. A profile of Uintatherium, the prehistoric mammal discovered by Joseph Leidy, but claimed by both Marsh and Cope. The World of Charles R. Knight is a website dedicated to the artist that briefly worked with Cope.